Can you confirm these amateur observations of Nerodia paucimaculata? Distribution USA (C Texas: Colorado River drainage from the Coke and Runnels counties line to near Bend, San Saba County on the Colorado River and in the Concho River from San Angelo [Tom Green County] to its confluence with the Colorado). Type locality: "The Colorado River south of the city limits of Robert Lee, Coke County, Texas." Types Holotype: AMNH 85542, a 652 mm male (D.W. Tinkle and D. L. McGregor, 8 Oct. 1960). Comment Densmore et al. 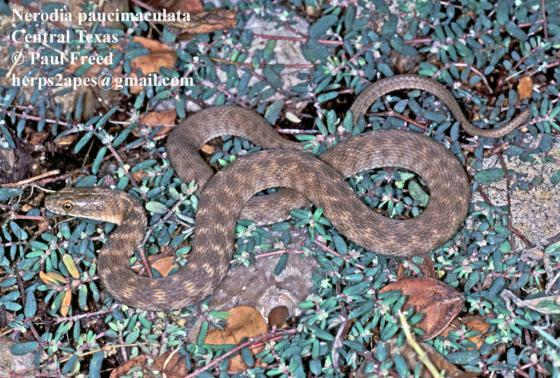 (1992) elevated Nerodia harteri paucimaculata to species status after Rose & Selcer had suggested that already in 1989.